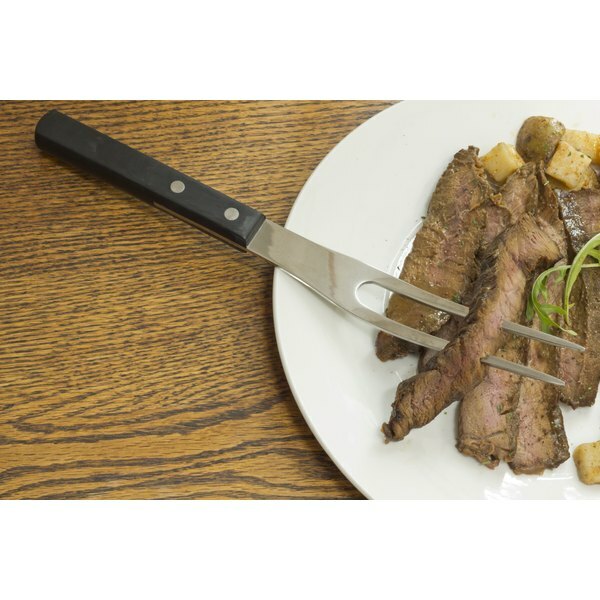 What Meals Can You Make With Cut-Up Steak? Sliced skirt steak on a plate. 1 What Meals Can You Make With Cut-Up Steak? 4 How Long Does It Take to Bake Minute Steak? Those familiar with the island know that Puerto Rican pepper steak is an island specialty. The Puerto Rican version of the pepper steak usually uses a skirt or flank steak, but you can substitute a thinner strip steak for a juicier flavor. The recipes for Puerto Rican pepper steak are as varied as the chefs that make it, but the pepper steak typically includes bell peppers, onions, garlic, tomato sauce and other piquant and savory ingredients that highlight the rich, meaty flavor. Rub the steaks with the sofrito. Sofrito is a savory combination of cilantro, garlic, olive oil, onion, peppers, salt and pepper. Purchase sofrito prepared and jarred in any well-stocked grocery store. Place the steaks on a plate and cover them with plastic wrap. Refrigerate the steaks for four hours or overnight. Take the steaks out of the refrigerator and allow them to warm to room temperature. The warm steak will absorb more of the sofrito and will stay more juicy in the hot skillet. Heat the olive oil in a skillet over high heat. Add the strip steaks and sear them for two minutes on each side. Place the steaks on a plate. Reduce the heat to medium-high and add the onion, garlic cloves and green pepper to the skillet. Saute the ingredients for five minutes, or until the peppers are tender and the onions are translucent. Add the tomato sauce, beef stock, cumin, oregano and salt and pepper. Bring the sauce to a boil. Reduce the heat to medium-low and place the steaks in the pan. Cover the pan and allow the steaks to simmer in the sauce for 30 minutes. Take the steaks out of the pan and allow them to cool for 10 minutes before you slice them into 1/2-inch-thick slices. Serve the steak slices covered with the vegetables and sauce. How Many Calories in a Taco Bell Bean Burrito?